Today’s topic is extreme drought. I say extreme realizing that any draught is a serious topic. Our state often has bouts of little to no rain; as many states do. While monitoring drought conditions is something that happens on the county level, it always helps to be aware of what the water conditions in your area are. Below I will cover ways that you can save on water, conserve water, and other random tips that can help you and your family in times of drought. First, develop a plan for drought. Having some of these water conservation tips in you PREPPER BINDER can aid in a quick, actionable plan when things dry up. Second, be sure to regularly check for leaks to minimize water supply loss. Have a check list of appliances, pipes, sprinkler systems etc. to check on a regular rotation so you can spot a leak and fix it quickly. -Take shorter showers! Yes, this stinks, but using an egg timer to limit your household shower times can save money and water together! -Install showerheads that increase the water pressure but decrease water usage. -Only wash loads of laundry when it is completely full. -Only run the dishwasher when it is completely full. -Don’t fill up the bathtub all the way. -Restrict non-essential water usage such as landscaping, watering the lawn, washing vehicles, filling swimming pools, running sprinklers in the yard for the kiddos. -Reduce the number of grazing animals to improve range management for farm animals. Basically, the less grass is being eaten the less watering you’ll need to ensure the grass is growing for said animals. -Incorporating drought tolerant (also called xeriscape) practices into landscaping ordinances to reduce dependence on irrigation. -Use permeable driveways and surfaces to reduce runoff and promote ground water recharge. -Turn off the water while you’re brushing your teeth or during other cleaning activities. -Adjust lawn sprinklers to water only the lawn, not the sidewalk or street. – Use rain-capturing devices for irrigation and garden watering. -Never pour water down the drain when there may be another use for it (water plants, gardens). -Repair dripping faucets by replacing washers or faucets. One drop per second wastes 2,700 gallons of water a year. -Retrofit all household faucets by installing aerators with flow restrictors. This reduces water usage without changing the water pressure. -Install an instant hot water heater on your sink; this limits the amount of water you have to run to get the water hot. -Insulate your water pipes to reduce heat loss and prevent them from breaking. -Install a water-softening system if the minerals in the water would damage your pipes; turn it off while you’re out of town, however. -When updating appliances, choose energy and water efficient appliances. -Install a toilet displacement device to cut down on the amount of water needed to flush. Place a one-gallon plastic jug of water into the tank to displace toilet flow. Do not use a brick, it may dissolve and cause damage to the internal parts. -Be sure installation does not interfere with the operating parts of the toilet. -Replace showerhead with an ultra-low-flow version. -Start a compost pile as an alternate method of disposing food waste. The Kitchen sink disposal requires a lot of water to operate properly. Also, compost is great fertilizer for garden or flower beds. -Clean veggies in a pan filled with water, rather than letting the water run. -Hand wash dishes by filling two containers. One with soapy water and one small with water and a small amount of bleach to rinse. -Avoid using running water to thaw meat or frozen foods. Defrost foods in the fridge or in the microwave oven. ­-Plant native and/or drought-tolerant grasses, ground covers, shrubs, or trees. Also, group plants together based on similar water needs. -Install irrigation devices that are the most water efficient to use such as a micro and drop irrigation and a soaker hose. -Use mulch to retain moisture in the soil. Mulch also helps control weeds. -Avoid purchasing recreational water toys that require a constant stream of water. -Avoid installing ornamental water features unless they reuse circulated water. -Consider rainwater harvest; if it is legal in your area. -A heavy rainfall eliminates the need for watering for up to two weeks. Most of the year, lawns only need one inch of water per week. -Water lawn in dawn and dust to avoid water evaporation. – Avoid leaving sprinklers or hoses unattended. A garden hose can pour out 600 gallons or more in only a few hours. 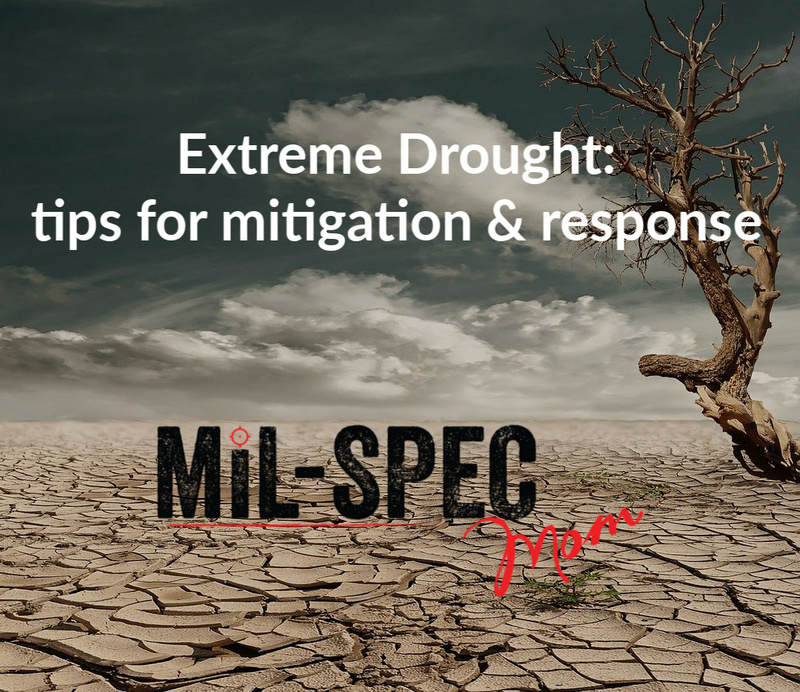 Hope this helps you in your extreme drought mitigation planning and prepping!